John Edwards, Chief Banking Officer of Bangor Savings Bank, tells the story of how Forge won the job to develop a new branding package for the bank. “Unbeknownst to us, they had spent time going around to several of our branches with a video camera—looking at and talking to employees, customers, and citizens, assessing the kinds of interactions they saw. And they brought the results to the presentation with us. “I remember thinking—‘wait, that’s it?! All these months and all we get is three words? But I remembered that first meeting, and said to myself, ‘hold on. These people totally got who we were; settle down, and trust that they’ve got something behind that slogan. What Forge did here is a classic example of Selling by Doing, Not Selling by Telling (see the chapter in Trust-Based Selling by that name). Buyers respond much more favorably to expertise that is delivered, not preached; skills that are deployed, not recited; examples that are based on us, not on others, and that are current, real-time, not after the fact. But Forge did something else, too. They rediscovered a truth that Mark Twain exploited in Tom Sawyer. Tom and Huck and the boys had snuck off for a trip down the river, and everyone back in town assumed the worst when their lost raft was found with a smattering of clothes, but no boys. The boys arrived back in town and discovered that everyone thought they were dead. They realized they could attend their own eulogy, and crept into the church choir loft to listen. What Twain wrote about was the deliciousness of a socially acceptable mode of eavesdropping on others talking about us—and hearing only wonderful testimonials. What Forge did, in part, was to hold up an ultra-realistic mirror to Bangor Savings Bank. Realistic, but idealistic as well, reflecting the best of the bank’s aspirations. 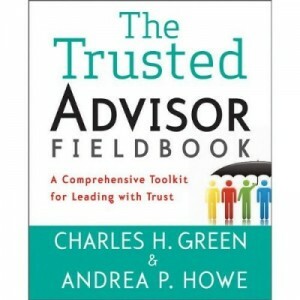 Trust-Based selling? You bet. Forge reached out in an intimate way to show they could appreciate the bank’s aspirations; and made evident their own skills not by reciting other banks’ dreams, but by crafting an image of Bangor Savings’ own dream. Competing With Your Supplier is Not a Best Practice Is Sales Efficiency Killing Your Sales?